A cairn was erecting on the site of the Township Hall at Gillies Hill in 1967. 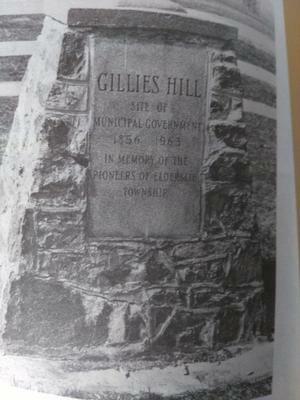 It reads "Gillies Hill - site of municipal government 1856-1963 in memory of the pioneers of Elderslie Township." For commercial use contact copyright holder for permissions and details.